What’s in the cards weather-wise for the 2014 Atlantic hurricane season? Although the start of astronomical summer for the northern hemisphere is still over a week away on June 21st, meteorological summer has already begun and with it, hurricane season, which runs from June 1st to November 30th. This year, NASA is deploying its latest weapons in its hurricane-hunting arsenal to study tropical storms like never before, including two new Earth observing satellites and two uncrewed Global Hawk aircraft. The Global Hawk flights are set to begin on August 26th from NASA’s Wallops Flight Facility based along the Virginia coast and run through September 29th. This coincides with the peak of the Atlantic hurricane season, when storm activity should be in full swing. The campaign is part of NASA’s airborne Hurricane and Severe Storm Sentinel mission, also known as HS3. One of the key mysteries that the HS3 program is targeting is the role that a dry hot air phenomenon known as the Saharan Air Layer or SAL plays in hurricane formation and subsequent intensification. Some studies suggest the SAL feeds and triggers hurricane formation off of the north African coast —a mainstream view held by many meteorologists — while other studies imply that it may actually suppress it. HS3 will also give researchers the enhanced capability to monitor and track the formation of thunderstorms near the core of hurricanes and tropical storms and follow their progression. To accomplish this, the HS3 Global Hawk aircraft will deploy devices that measure humidity, temperature and wind speeds known as dropsondes. All of the dropsondes to be deployed by NASA in the 2014 season are managed by the National Oceanic and Atmospheric Administration. Global Hawk aircraft are ideal for hurricane tracking and hunting because they can stay aloft for up to 26 hours and fly at altitudes of over 18,000 metres. HS3 mission control for the Global Hawks is based out of NASA’s Wallops Flight Facility. The first Global Hawk will provide data on the storm’s environment. The gear it uses to accomplish this will include the Cloud Physics Lidar (CPL), the Advanced Vertical Atmospheric Profiling System (AVAPS), and the Scanning High-resolution Interferometer Sounder (S-HIS). Global Hawk number two will analyze the core storm regions to gauge temperature, humidity, surface winds and precipitation. It will use an array of instruments to accomplish this, including the High-Altitude Monolithic Microwave Integrated Circuit Sounding Radiometer (HAMSR), the Hurricane Imaging Radiometer (HIRAD), and Doppler Radar. In orbit, the Global Precipitation Mission (GPM) will continue with the legacy of the Tropical Rainfall Measuring Mission (TRMM) and follow hurricanes through all phases of formation and decay. A joint NASA/JAXA mission, GPM was launched atop an H-IIA rocket earlier this year on February 27th from Tanegashima Space Center located on the southern tip of Kyushu Island in Japan. Of particular interest to GPM researchers is the formation of deep thunderstorms known as hot towers near the hurricane eyewall. GPM is located in an 65° degree inclination in low Earth orbit and will be able to track hurricanes and study hot tower formation as they move out of the tropics. Newsflash- no sooner than we finished this article than we noticed that a rocket booster associated with the GPM launch is set to reenter soon on June 17th. 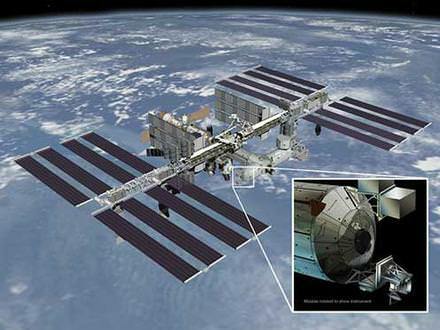 A diagram of RapidScat’s future home on the ISS. Credit: NASA/JPL-Caltech/Johnson Spaceflight Center. And finally, RapidScat is set to head to the International Space Station later this year. Set to be mounted on the exterior of the Columbus module of the ISS, RapidScat will be an invaluable tool for monitoring ocean surface winds and is a cost effective replacement for the QuickScat satellite that ceased operation in 2009. RapidScat is set to launch on a SpaceX Falcon-9 rocket as part of the CRS-4 Dragon resupply mission slated for sometime this August. These assets will give NASA the ability to study hurricanes that form during the 2014 season like never before. And speaking of the ISS, the live camera that now broadcasts HD images 24 hours a day will make for some interesting views of hurricanes online from space. And what’s on tap for the 2014 Atlantic season? Well, forecast models out of Colorado State University suggest that an anomalous cooling early on in the Atlantic will lead to fewer than usual named storms, with perhaps only 9, as opposed to the usual average number of 12. Of these, perhaps 1-2 will reach category 3 or higher, as opposed to the average number of 3. A leading factor in this weakened trend is the possibility of a moderate to strong El Nino event earlier this year. Keep in mind through, that it only takes one destructive hurricane to wreak havoc, and these still can and do occur, even on off years. Whatever the case, NASA and the NOAA will have all their tools at their disposal ready to study these powerful storms as the season rolls on.